I've got a competitive streak, but I really, really don't like contact sports. My theory is that I took a soccer ball to the face one too many times in gradeschool P.E. I still shudder when I recall the horrific flag football quarter of '97. I somehow managed to survive to 8th grade, mostly by learning to run really, really fast. At that point, I was also the volleyball player who crouched down in a panic, squeezing my eyes shut and covering my face to let the ball hit the floor around me instead of trying to bump it. Which is probably why I always got a B or a C in P.E.. Duck and cover doesn’t really earn you a lot of points. So when I heard about the BYOB (build your own burger) at the Rookwood in Mt. Adams, which includes a competition to build the best burger, I was all for it. No tackling, soccerballs or take-downs. Just you, your friends, and the burger menu. Construct your burger with care, and at the end of the night, the chef and staff choose their favorite and you get a free burger next time. We arranged to go with 5chw4r7z and Ms.5chw4r7z. 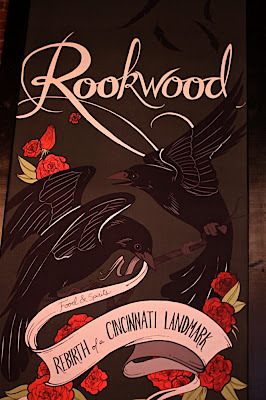 We loved the renovations to the Rookwood. The kilns have been converted to little mini rooms, which can be reserved for 6-9 people. We sat in the main dining area, but next time, we're getting one of the kilns. The place has a sort of steampunk-y feel which I liked. The entire restaurant is bathed in orange and red light, making photos a definite challenge. 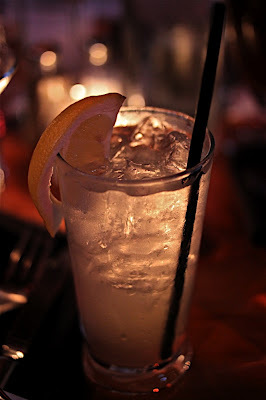 The cocktail list is impressive and interesting. David chose a Com Tollins, with citrus vodka and juniper syrup ($8), and I chose a Cloud Nine cocktail ($9). 5chw4r7z opted for the Stone Pale, which was recommended by our server. Ms. 5chw4r7z went with a glass of white. The beer list isn't huge, but what it lacks in size it makes up for in quality. 21st amendment, Dark Horse and Stone were all featured, as well as many other quality beers I'd have been happy to order. After much debate, we chose to get the chicken fried bacon to split as an appetizer. It was excellent, and served with a jalapeno honey that offset the saltiness of the bacon. Appetizers and drink orders out of the way, we grasped our pencils, burger menus and prepared for competition. Bob chose to go the heart attack route, with bacon and fried baloney, as well as a fried egg. David chose goat cheeese, ranch dressing, mushroom, tomato and pickle. Ms. 5chw4r7z chose her toppings as well, among them white cheddar and fry sauce (a mixture of worcestershire, ketchup, sriracha and mayo). I thought and thought about my burger, paralyzed by choice, circling and scribbling out toppings, and finally decided to go griddled, with a fried egg, chili, Velveeta and fry sauce. I labeled my burger "keepin' it classy" and sent it off to the kitchen. When our burgers arrived, they were served on a plate with crispy fries. Except mine, which was a giant, chili covered burger monstrosity in a bowl. I happily started eating mine with a fork and knife. Everyone at the table abruptly stopped conversation as we dug into our burgers (after sufficient photography, of course). I never thought that my burger would win. Though it was delicious, it wasn't pretty. It was sloppy and gloriously messy and it was by sheer luck I didn’t drop any chili in my lap. But, lo and behold, our server comes over to talk to us and lets me know that my combination had won best burger! The chef came out to take my name for the free burger next time. I should have asked him why he picked it, but I didn’t. Maybe he respected the bold move that is ordering chili on a burger. Or, he like I can appreciate the virtues of Velveeta's melting powers. We left the Rookwood planning our next visit--which is always a good sign. The burgers are of excellent quality and Wednesday night is a great value and a fun time. I thought the regular menu was also appealing, and the desserts --Brekenridge vanilla porter float with salty caramel ice cream? Wow-- were very tempting. Honestly, I think we all still felt guilty about the chicken fried bacon, so we skipped desserts this time for fear of keeling over in the parking lot. Congrats, good looking burger! chili + velveeta ftw. I've only visited late for drinks and I did notice their beer selection was pretty great. Would you recommend for dinner?